I hadn't realized until just a few days before Christmas last year that Luke and I have always spent Christmas day with other people. Before we moved overseas, we always spent it with family - either at his or mine. Then, the first two Christmases overseas were spent with friends in Aberdeen. As much fun as it is to spend Christmas with people with love, I was really looking forward to spending it just the two us! Mr. Scrooge worked on Christmas Eve, but he met me at Westminster Cathedral so we could go to mass together. 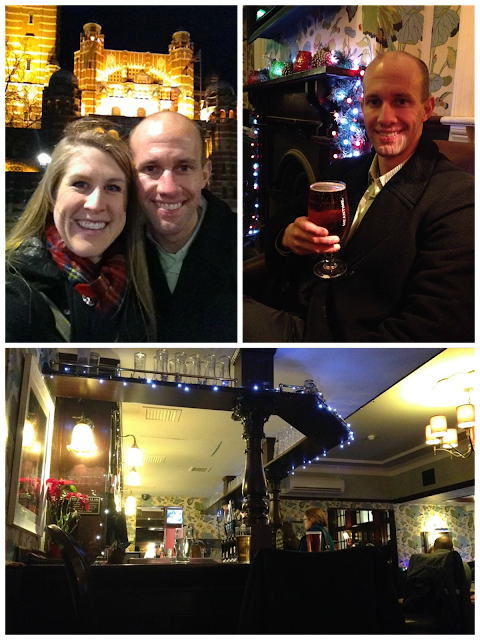 After mass, we went back to Wimbledon, and before walking home, we decided to stop at the pub for a drink. But of course. I was planning a feast for Christmas day! In fact, I went a bit overboard on the food. To make things easier, I prepared as much as I could before Christmas day. On Christmas morning, I woke up and baked the Cheesy Jalapeno Bacon Fudge and French Toast Casserole. Both of those things could have fed a family of 30 that morning. Ooops. Luke demanded we watch Christmas movies all day while wearing Santa hats and pajamas, so that's what we did... at first. Meanwhile, I set out more food for us to snack on - Deviled Eggs, Cheeseball with crackers & bell peppers, and Sweet'n'Spicy Nuts. I also made us Egg Nog as Luke and I never had it before. It was a beautiful day, and we realized we didn't want to spend the whole day inside, so we changed out of our PJ's. All public transportation shuts down for Christmas day, so we went for a walk up to Wimbledon Village in our Santa hats. Pretty much everything is closed on Christmas Day except for one thing, and Ill give you one guess as to what that is. If you guessed pubs, you are a winner!! It is a tradition in England to head to the pub for Christmas lunch, so quite a few pubs open their doors from around 12pm-5pm. But I heard that a reservation is pretty necessary to do lunch which we weren't expecting to do anyway. So we stopped for a few drinks on our way before heading back to the apartment. We changed back into our PJ's, and it was about time for me to begin preparing the big feast. We were still full from breakfast and snacking, and there were still more snacks on the table, but I had all this food that I needed to make. I roasted a pork belly with crackling, garlic-onion gravy, baked sweet potatoes, threw together a green bean casserole, and lastly heated up some sauerkraut. If this doesn't look good, well then I don't blame you because those are awful pictures! Not only am I the worst photographer (on Christmas Day), but I also put zero thought into our table setting. Anyway, I went just a tad overboard on the food, dontcha think? Just a tad. We slept well that night as visions of burnt pork fat danced in our heads. Nom. Id say it was a success! December 26 is a holiday in Britain (called Boxing Day), so Luke had that day off as well. Some of the public transportation was still shut down, so we just hung out at home. Except for the few hours we took to sell the car! Our next big adventure was moving homes from Wimbledon to Central London! Eeeeek!!! Google tells me that the last time it snowed on Christmas Day in London was in 2001. And that my friends completes my blog posts for 2014! FINALLY!